Lava is not the only thing flowing out of the fissures of Kilauea on Hawaii. Sulfur dioxide, a foul-smelling and toxic gas, has also driven people from their homes. According to the USGS, sulfur dioxide levels near the volcano have been measured above 100 parts per million. That is a level considered dangerous to human health. Noxious on its own, sulfur dioxide is also the main ingredient in volcanic smog. Known as vog in Hawaii, it can have a variety of adverse health effects. Vog occurs when the sulfur dioxide spewing from a volcano reacts with oxygen, moisture, and other particles in the air in the presence of sunlight. It is considered a form of air pollution, not unlike that given off by power plants burning sulfurous coal. Looking back to December 1948, a similar type of toxic smog caused by unregulated industrial pollution killed 26 people and sickened thousands of others in Donora, PA.
Volcanic smog can irritate the skin, eyes, nose, throat, and lungs. Shortness of breath and dizziness can also occur. Its effects can be even worse for anyone with respiratory problems or lung disease. This threat, on top of the flowing lava, has led public health officials to order an evacuation of areas around the fissures, such as the hard hit Leilani Estates. Other parts of the Big Island, however, have reported moderate to good air quality. This is largely because the region’s prevailing northeast trade winds have been pushing the vog offshore. If those winds slacken and a southeasterly flow emerges, the vog could impact a wider area, including other islands in the Hawaiian chain. The issue of climate change mitigation was front and center in Washington, DC yesterday as the EPA unveiled its new Clean Power Plan. The proposed regulation would reduce carbon dioxide (CO2) emissions from all the fossil fuel based power plants across the United States. 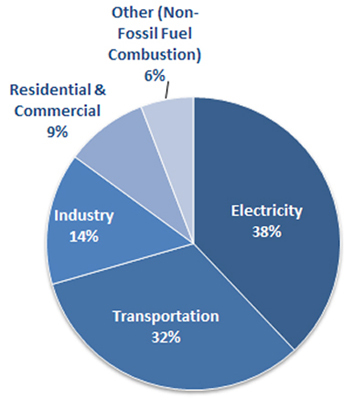 According to the EPA, “The combustion of fossil fuels to generate electricity is the largest single source of CO2 emissions in the nation, accounting for about 38% of total U.S. CO2 emissions in 2012.” Since coal is known to release more CO2 than any other fossil fuel, this new regulation targets existing coal-fired power plants. Specifically, it calls for a 30% cut in carbon pollution compared to 2005 levels by 2030. To comply with this new national regulation, individual states will have flexibility in how they choose to cut emissions. Some options include increasing energy efficiency, maximizing renewable energy sources like solar and wind, and joining a regional cap-and-trade program like RGGI in the northeast. In addition to fighting climate change, this new rule would also improve air quality and human health. Issued at the direction of President Obama under the authority of the Clean Air Act, the EPA says this regulation will “reduce pollutants that contribute to the soot and smog that make people sick by over 25 percent.” In fact, the agency projects the lower emissions will help avoid as many as 6,600 premature deaths and over 100,000 asthma attacks in children. While this new rule is not without its critics, EPA Administrator Gina McCarthy emphasized the need for action. In a press conference, she said: “This is not just about disappearing polar bears and melting ice caps. This is about protecting our health and it is about protecting our homes.” The new regulation – scheduled to be finalized next summer – will also help the U.S. meet its commitment to the U.N. to cut carbon pollution by 17% by 2020. The smell of smoke filled the air in New York City Monday morning. Its source was a 1,600-acre brush fire in Wharton State Forest, NJ – about 90 miles away. Burning since late Sunday, the smoke was trapped near the ground by a local temperature inversion. This is a weather phenomenon where the temperature in the atmosphere increases with height instead of decreasing. Essentially, the inversion layer acted like a lid and caused the smoke to spread out horizontally rather than vertically. A low level wind from the southeast then carried the smoke toward the city. 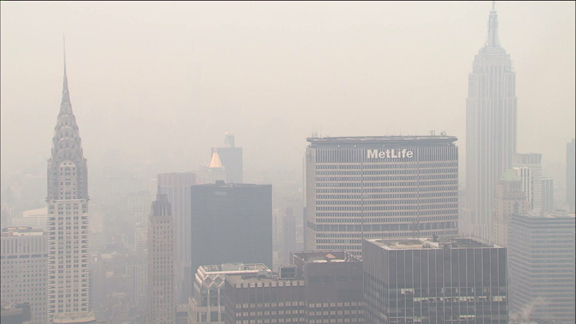 The smoky haze prompted the EPA to issue an air quality alert for the NYC area. With a spike in the pollutant known as “fine particulate matter”, this was the first time this year that the city’s air quality dropped below “moderate” on the agency’s AQI scale. Smoky haze fills the air in NYC. Image Credit: PIX11. Air pollution has long been linked to a number of health problems, including respiratory and heart diseases. Now, it has been shown to cause cancer. The International Agency for Research on Cancer, a division of the World Health Organization, released a report on Thursday which concludes prolonged exposure to air pollution and particulate matter can cause lung cancer and increase the risk of bladder cancer. Unlike some other environmental carcinogens, air pollution is nearly impossible to avoid, as we all need to breathe. Caused by vehicle exhaust, power generation, industrial emissions, and residential heating, its sources are ubiquitous. While the report did not quantify risk by country, some places are more polluted than others. Here in the United States, the Clean Air Act has helped improve air quality in recent years. Nonetheless, pollution continues to cause health problems for many people across the country. Globally, according to the IARC, air pollution contributed to 3.2 million pre-mature deaths in 2010 alone. More than 200,000 of those were from lung cancer. New Yorkers can breathe easy. The city’s air quality is the cleanest it has been in fifty years. While speaking at a Climate Week NYC event yesterday, Mayor Bloomberg announced that the city’s sulfur dioxide levels have decreased by 69% since 2008 and soot pollution has dropped 23% since 2007. This data is based on the results of a New York City Community Air Survey, which monitored air quality at one hundred locations across the five boroughs. This impressive reduction is largely attributed to the Clean Heat Program, part of the larger PlaNYC initiative for an environmentally sound city. The program encourages building owners to phase out the use of heavy heating oils that pollute the air. Over the past three years, according to the mayor’s office, approximately 2,700 buildings have converted to cleaner fuels. Following regulations established in 2011, the use of dirty heating oils in NYC will be illegal by 2030. Since air pollution is known to aggravate cardiovascular and lung diseases, public health officials estimate that the cleaner air is preventing 800 deaths and more than 2,000 emergency room visits each year.